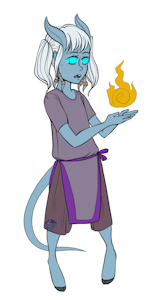 Little Draenei Mage - Jalnora. I'm very open to getting joint commissions or even just letting you get work of my character or with my character done. But when it comes to any kinks a bit more odd or extreme message me first. Anything Bathroom, Diaper, Baby, or Gore related is always a hell to the no. Macro/Hyper stuff as well. When it comes to vore it's a bit more situational but I'm generally not that interested in it. For more info on general kinks I like check out the loli draenei Jalnora for more info. Her pictures have links to her f-list.